Jambo is the friendly greeting Swahili traders offered their customers in Central Africa before colonization. The players are traders in this day, competing to be the first to earn 60 gold by buying and selling tea, hide, fruits, salt, silk, and trinkets. The game is played with cards which allow players to buy and sell goods, can help you or hinder your opponent, and others which add a bit of spice to the game. Return to the dark continent where the players alternate turns with up to 5 actions each until one player reaches the goal and wins the game. Admittedly, there is quite a bit of luck involved – the luck of the draw. No dice are used. You do have a few options you can make each turn, but when it comes down to it, it is about getting a good hand. *Play a Utility card (Utility cards get turned face down after use, then at the beginning of your next turn, you may use it again). Utility cards will do things such as pay 1 gold and receive 1 ware of your choice. *Play a person card. These cards are normally instant quick-fixes such as: draw 2 more cards. *Play an Animal card. These are attack cards. They could do things such as “Both players place all their cards (only the cards in their hand, not the utility cards or marketplaces which are face-up on the table) face up in the middle of the table, then each player takes it in turns to take a card of their choice. So for example with this card, if you were down to 2 cards and your opponent clearly had about 10, this card would be beneficial for you to use! *Play a Ware card. These cards are the core essence of the game. For example, a ware card may have 2 sugar and 1 tea. It will also have 2 gold values, one higher than the other. If you want to buy these goods, you place the card in the discard pile, take the wares on the card, place them on your market stand, and spend the gold of the lower number on the card. If you want to sell these goods, you would have to find that exact same card again, and then you would discard the card again and gain the amount of gold which has the higher value of the 2 values written on the card. Remember: You have 6 slots on your default market stand, and all the ware cards have different wares on them, so for example, you could buy on 1 card: 2 tea and 1 fur for 3 gold. Then with another card, you could buy 2 sugar and 1 Textiles for 4 gold. Now your market place is full with 2 tea, 2 sugar, 1 fur and 1 textiles, and you have spent 7 gold. You could then find another card which is 1 fur, 1 sugar, 1 tea. You could then sell these items for the higher value stated on the card (which is usually about 10 gold) so now you’d have sold half of your wares but have made 3 gold profit and you still have 3 wares left! So that’s all the game is. Some strategy, some luck of the draw, and some good, fun, simple buying and selling for profit. The only downside to the game is the game time. 1 game could last 30 minutes, yet another game could last 3 hours. It really is based on how much attacking is going on, and how lucky the players are with the ware cards they’ve been finding. (For example, player 1 has 3 tea and 3 fur on their market place. He keeps drawing ware cards which require him to have 2 sugar and 1 fruit, and he’s not finding any cards which allow him to trade 1 ware for another ware. This player is not going anywhere in a hurry, and Player 2 could be having a similar problem). The rule-book is about 6 pages long and is mostly pictures. Pretty much anyone could play this. It’s a great filler game/travel game, and it just runs so smoothly. Bear in mind though it is 2-player only! If you already have a light-weight, compact, 2-player filler game which is your go-to game for the occasion, then maybe you won’t need this game, but if you’re looking for a game to fit those specifics, I would highly recommend this game! tl;dr: See 2 previous paragraphs! Some strategy, some luck, and a whole lot of fun! Take it in turns to buy for little and sell for lots! Simple! 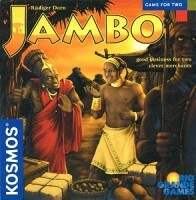 Add a Review for "Jambo"